This photo holds a lot of meaning for me personally. This was taken when my husband and I were on our honeymoon in 2007. We had just had our second wedding in Bangalore and were traveling the countryside near by with his cousins. After a day or two in Bandipur to see the nature preserve, we headed back to Bangalore, stopping in Belur to see the temple. My hands and feet were covered with mehendi, which was a source of amusement to not only me, but most of the Indians as well. 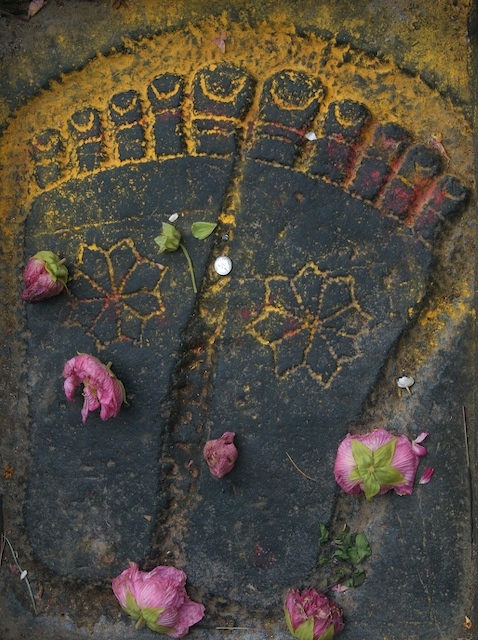 While I was at the temple, walking around barefoot, I stopped to take some pictures of my own feet. I have a penchant for doing this on vacation. While doing so, I noticed one woman trying to catch a glance of what I was doing, a knowing smile on her face. We smiled at each other, and I carried on. When I came across this image, doused in tumeric and decorated with offerings of flowers, I couldn’t help but think of my own decorated feed, and the role they played in our Indian ceremony (the husband helps the bride take steps with a rock under her foot). A friend purchased this as a wedding present and I couldn’t think of anything more befitting. Every time I look at this, it reminds me of my own wedding, my own vows, my own decorated feet. I hope the lucky newlyweds gathered the gist of that feeling.